COMS is a set of products that create a single dashboard on all sites, owned and leased. It’s the ideal solution for anyone who needs to monitor multiple sites from a single location. Perf-iT COMS is a single dashboard for all your sites. It is versatile and secure at the same time. You can see the parameters of your own AND leased white spaces without jeopardizing the integrety of the datacenter’s data. Two IoT devices (ColoBOX and SafeBOX), connected with a one-way serial link guarantuee a 100% secure connection while having a live connection to each site. Telecom operators and large content distributors use a network of datacenters to streamline their network activities. Sometimes these are owned sites but mostly they are rented white spaces in datacenters owned by others. A common issue with these leased sites is that the DC owner is reluctant to give full access to their KPI information. Having their data connected to ‘the Internet’ could jeopardise its integrity. This is where COMS comes in: It’s a non-intrusive tool that gives you full access to the DC’s measurements while guaranteeing the security of the DC. You want to be able to monitor the environmental conditions, the reduncy stays and uptime of your server farm. You want to check if the DC operator complies to his SLA. You even want to help him(her) to prevent outages. But how do you get to the required measurement data if the DC management will not open to up outside? Now you can convince the DC owner to implement COMS by installing the ColoBOX.You install the SafeBOX and connect it to the ColoBOX with a one-way serial link. 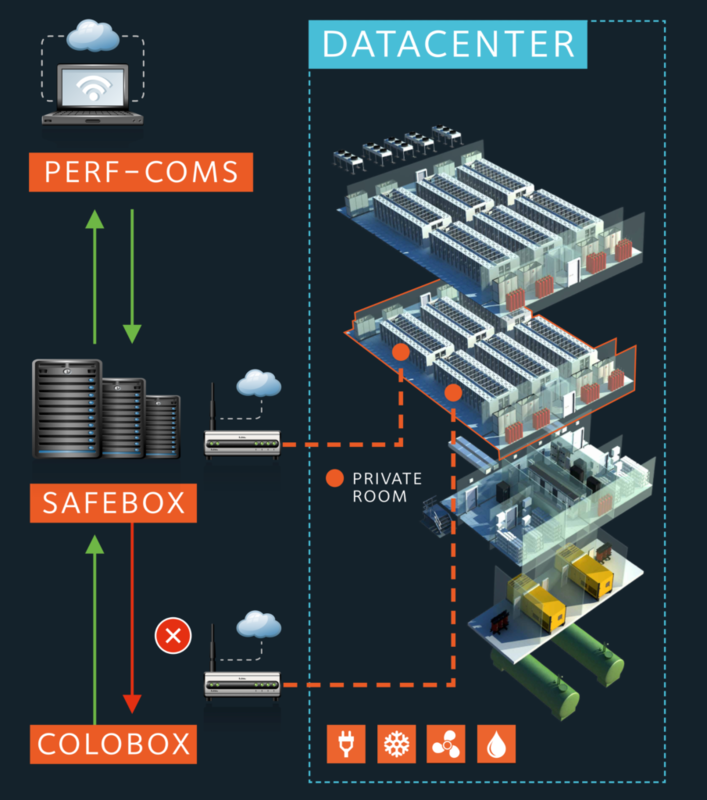 The data flows from ColoBOX to SafeBOX. there is NO RETURN PATH >>> 100% secure! You can optionally connect your own sensors to the SafeBOX and access it through your private network. Now you can see all in a single dashboard.